There’s a pretty good chance you’ve never heard of “knob-and-tube wiring” before. You probably don’t know what it is, what it’s used for, or why it could be dangerous. You might even have knob-and-tube wiring in your home or building without knowing it. By the end of the 1930s, most city-based homes and around a quarter of rural ones had electrical wiring. More homes were gaining access constantly, and the go-to method for wiring these homes was knob and tube wiring. Knob-and-tube wiring gets both parts of its name for pretty obvious reasons. The “knobs” refer to the ceramic knobs that are used to hold the wires. The “tubes” refer to the ceramic tube casings that protect the wires within walls. Most modern electrical installations have three wires. A hot wire, a neutral wire, and a ground wire that’s used in case of a short or excess charge. In knob-and-tube wiring, however, there are only two wires: the hot and the neutral one. This makes the system less safe than modern electrical systems. First, you probably don’t have knob-and-tube wiring if your home was built sometime in the last twenty years. Knob-and-tube is rarely used to wire or re-wire modern buildings. If your home is older than that, however, you may have knob-and-tube. The easiest way to find out for sure is by looking inside a wall. If you see the telltale ceramic knobs and tubes, then you know. If you can’t look inside your walls, you should also look at your outlets. As a consequence of its two-wire system, homes with knob-and-tube outlets can only have two prongs, never three. Having a three-pronged outlet or two doesn’t necessarily mean you don’t have this form of wiring, however. Some homes have modern ground fault circuit interrupters as a stop-gap between old systems and rewiring. These will be three-pronged if they’re in your home. If your home is old and you have mostly two-prong wiring, then you may have knob-and-tube wiring. If my home does have knob-and-tube wiring, what should we do about it? There’s no immediate risk to your safety if your home has working knob-and-tube wiring. That doesn’t mean you should ignore your wiring for long, however. Knob-and-tube wiring is insulated using rubber, which can degrade. When it does, wires get exposed to air and moisture. Exposed wiring could spark, fray, or even break, potentially starting fires. Knob-and-tube systems are more easily overloaded as well. These wires can only handle twelve circuits inside a home. Historically, if more circuits were needed, electricians would splice knob-and-tube wires. Unfortunately, that splicing further makes potential overloading, overheating, or shorting all the more likely. Long story short: if you want guaranteed safety, you’re going to need to rewire your home. What should I do if I’m curious about replacing it? Find a company that has years of experience delivering expert electrical services. When you do, try to already have pertinent information like the age and size of your home on hand. 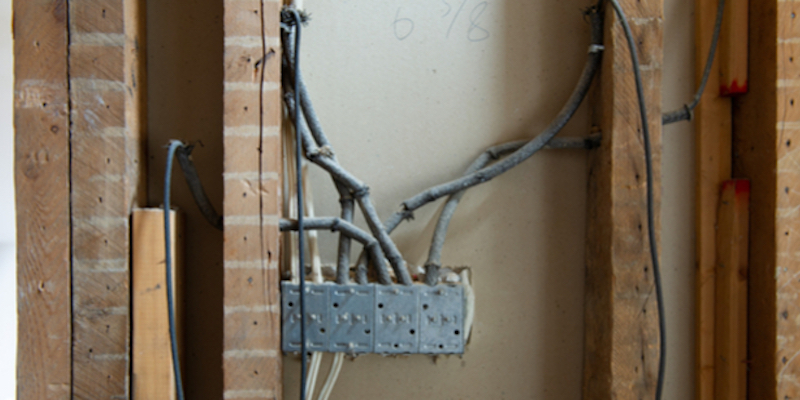 The cost of a whole home rewire depends on these and other factors. If you want to save yourself some time, you can also get in touch with Mike Diamond. We’ll answer your questions and walk you through the process with full transparency. It’s never the wrong time to update your home’s wiring and keep your family safe.